Southern Illinois University Edwardsville’s Stratton Quad was blanketed with 1,100 backpacks on Monday, Sept. 12 to raise awareness about suicide prevention. 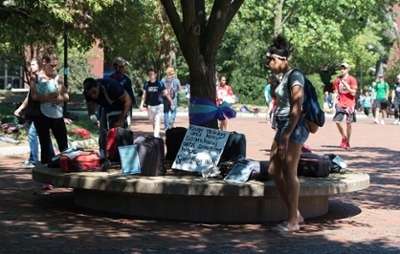 The empty backpacks and the stories displayed on them offered an emotional representation of the number of college students who die by suicide each year. The Send Silence Packing display is presented by Active Minds, the leading national nonprofit that empowers students to speak openly about mental health in order to educate others and to encourage seeking help. The powerful exhibit was sponsored by SIUE’s iCARE (Initiative to Create Awareness, Recognition, and Education on Suicide Prevention). Student volunteers and iCARE representatives shared information with the SIUE community about suicide prevention and available campus resources as they stopped to view the display. The traveling Send Silence Packing exhibit visits approximately 20 colleges and universities annually. The event, along with others held Sept. 5-11 on campus during International Suicide Prevention Awareness Week, are part of SIUE’s initiative to improve mental health awareness and student access to services. iCARE is a multi-tiered collaboration between the SIUE Schools of Pharmacy and Nursing, and Counseling Services through a secured grant through the Substance Abuse and Mental Health Services Administration (SAMHSA). For more information on iCARE, contact Kelly Gable, PharmD, associate professor of pharmacy practice in the SIUE School of Pharmacy, at kgable@siue.edu or Lisa Thompson-Gibson, counselor and suicide prevention project coordinator at lithomp@siue.edu. 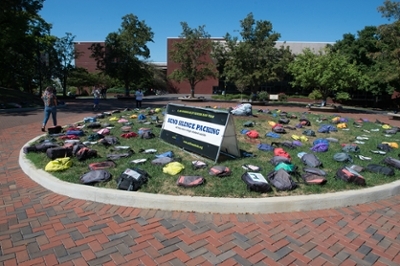 Photos: The Send Silence Packing exhibit displayed 1,100 backpacks on SIUE’s Stratton Quad on Monday, Sept. 12, in representation of the number of college students who die by suicide each year. SIUE students stopped between classes to read the stories included on the backpacks on display at the Send Silence Packing event.